The Don Alejandro gets its name after one of the most famous Cuban tobacco grower, Alejandro Robaina, which was working for the family business even before the revolution. Its amazing tobacco, growing in the Vuelta Abajo region, was many times honored by the Cuban government as Vegas Robaina was named best tobacco grower during the 1990’s. The Vegas Robaina Don Alejandro is of Prominente format, 49 ring gauge and 7.6 inches (194mm) in length and was launched in 1997 along with the brand other vitolas. It is a very beautiful cigar to start with; the wrapper is incredibly smooth and has a nice milk chocolate color. The cigar smoke starts off with lots of chocolate and creamy coffee. There is also some leather, some nuts, a bit of wood and vanilla. Some notes of cherries are also to be found. The cigar is very smooth, never too harsh, oscillating between a medium and a medium-full body. The construction is impeccable, flawless draw from the start to the finish, sharp burn line, slow burn and smokable until the nub. A great Double Corona. 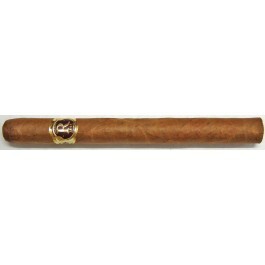 The Vegas Robaina Don Alejandro is a very smooth smoke, full of flavors and is a medium bodied cigar. • Lots of creamy coffee, various arrays of chocolate, milky, dark; earth, nuts and some cherry notes. • Great smoke out of the box. This cigar simply one of the best Double Coronas. The cigar is looking great, almost perfect. The nice box-press makes it almost square. It has a beautiful medium brown color, like milk chocolate. It is very smooth to the touch, one of the smoothest Habanos, thanks to its velvety and slightly oily wrapper. Only very few tiny veins or marks are visible. It is mostly firm when squeezed with just enough give on the foot. The wrapper smells of chocolate and hay. Once cut, the draw is amazing and remains like it throughout the whole cigar, surprising for a cigar of this format. The burn is sharp right from the start, doesn’t require any touch ups. The cigar burns slowly and never gets too hot. It produces an abundant amount of smoke. The first third of the cigar is incredibly smooth with lots of creamy flavors. There is some pepper at the beginning, soon joined by some coffee taste, with touches of milk. The flavors evolve, first to a much sweeter profile, with milk-chocolate then to a deeper and richer profile, full of dark chocolate, leather. In the end of the third, the cocoa notes are fading away, leaving opportunity to taste some black cherries. Overall, it is a mild and smooth cigar, very well blended, sitting at a medium body range. In the middle third, the flavors increased as well as the body and the strength of the cigar, closer to a medium to full body now. The dominant flavors are still of creamy coffee and other flavors join the mix, some earth, some nuts, almost like roasted almond. There is less chocolate now, but there are still some savory notes of dark chocolate. The flavors are stronger in intensity but there is no harshness at all, the smoke is still silky smooth. In the final third, the flavor profile remains similar, with the addition of more spice, more chocolate and still lots of creamy coffee and black cherries. The smoke is still very smooth and still a medium-full body. In summary, it is a great cigar that provides a great mix of flavors, with plenty of mocha/coffee flavors, starting very mellow and ending much stronger.